A patio canopy can add architectural style to your property, can increase its value, can help to protect your patio doors and windows from the weather, and can help you enjoy your outdoor space more of the time, regardless of what our beautiful UK weather has in mind! 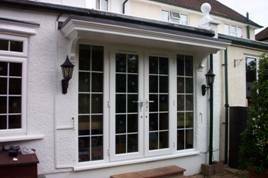 At Architectural Fibreglass Mouldings (AFM) we are delighted to bring you a wide range of patio canopies, roofs and shelters, all made from our high quality glass reinforced plastic (GRP). This material not only allows us to manufacture products in a staggering range of styles, designs and colours, but also offers outstanding protection against the weather, including water and extreme temperatures. GRP doesn't warp, rust, split, or need regular treatments to keep it looking new. They're the ultimate in convenience, and one of our most popular range of products. Take a look at our gallery, or ask us to send you a brochure, and you can see for yourself the enormous range of styles and designs available. We can manufacture and fit patio shelters and canopies for older properties and new build properties, with styles ranging from mock tile to slate, mock lead roofing to plaster, helping to blend seamlessly with the style and appearance of your property. The great thing about our GRP patio roofs is that they are deceptively lightweight, which means they are quick and easy to install, don't require massive supports or invasive bolts through your walls, and yet can still look very sturdy. But don't let their lightness fool you, because the GRP material we use is incredibly tough and durable - fully designed to cope with the extremes of our British weather! Every one of our canopies and shelters is made onsite by our own experts, which means that at every stage of the manufacturing process we are able to guarantee the quality of every order. But our commitment to quality doesn't stop once your canopy or shelter is delivered, because we only employ the very best fitters to carry out a professional installation, making sure that you are completely satisfied, and are able to enjoy many years of pleasure, and dryness! For more information, or for help with any questions you may have please contact our customer service team who will be happy to help. Want more information on our range of Patio Canopies, Roofs & Shelters?